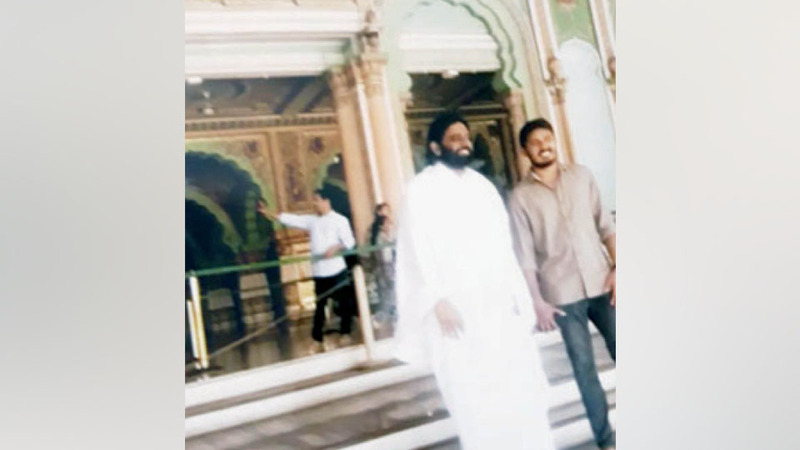 Mysuru: A Constable attached to the Mysore Palace security has been suspended after a photo of a Godman from Kerala violating security rules of the Palace went viral on social media. Constable Chikkanna, who was posted in the Palace Security, is the person who has been suspended. Swamiji Sunil Das, a Godman from Kerala, is said to be close to the erstwhile royal family of Mysuru. Giving this as an excuse, he is said to visit the Mysore Palace regularly. By taking the Police security into confidence, he is learnt to visit even the strong-room where the diamond-studded Golden Throne is kept, thus violating the security rules. Swamiji Das, who is running Sneham Charitable Trust at Palakkad in Kerala, is said to be sitting in Palace Security ACP Shailendra’s chamber on his chair and holding discussions with the Police, taking photographs with his followers and loitering round the Palace. The photos of some of his activities have been posted on social media. Even though ACP Shailendra is said to be aware of these transgressions, he has failed to protect the security of the Palace, it is alleged. However, as the photos went viral, Constable Chikkanna has been blamed for posting the pictures of the ACP with the Godman and suspended. Plea for mercy killing: Suspended Constable Chikkanna is learnt to have written to Police Commissioner asking for mercy killing. Even though he has not committed any mistake, he has been harassed and suspended. Hence, he should be sentenced with mercy killing, he has written, it is said. Meanwhile, Police Commissioner Dr. A.S. Subramanyeswara Rao told the media that there was no security lapse in the Palace. Constable Chikkanna was suspended for spreading false news with the aim of creating a controversy. Apart from that there are several pending enquiries against the same Constable, he added. I think the police commissioner should be fired, not the costable for exposing his corrupt superiors. Who is this conman from Kerala? Ban him visiting Mysore!!! First of all, mysore palace is private monument place, royal family made mistake giving authority to govt. Stupid security by police dept. Save and follow the rules of Mysore palace. Commissioner should be fired and constable to be rewarded and re instated. i fully agree with you. police commissioner must not only be suspended but removed from service and must be jailed.